Over the past year or so, I’ve been slowly upgrading bits of my travel kit to allow for keeping the size of my bag way down while maintaining reasonable creature comforts. Most of what I had to begin with is from when I first went backpacking in 2004 with what I think is about a 65 or 70L pack plus a 15L daypack. TOO BIG. My current bag is 40L, which is perfect (and carry-on size! though I’ll probably end up checking it on the way home because I’ll have my Gerber in there), except maybe when it comes to winter gear. But seeing as how I’ll probably be WEARING all the outerwear, I don’t think I’ll need to pack it away very much. I’ve not decided what kind of bag to bring for carrying things around all day. A backpack is obviously handy, but also more to worry about when it’s on your back. The shoulder bag I use at home right now is pretty beat up so I may just use that. Particularly because if it gets destroyed or lost or stolen, I won’t really care. Anyway, the thing about downsizing to fit this minimalist packing style is that it requires making use of good design, both in specific products and also in the decisions I’m making about what goes in and what doesn’t. And that makes it even better for me, because I love a bit of good design. I’m a sucker for a product that someone clearly thought through from every angle and has a level of awesome to reflect that. Efficiency! Plus style. I will totally pay for it. I’d rather pay more now for something I’ll use another 10 years. Case in point: my transformer sunglasses. The best! On the technology front, there was the stronger-lighter-faster computer upgrade – from a 13″ MacBook Pro to a 13″ MacBook Air, half the storage and a fraction of the weight and size – and the Kindle so I could carry a library rather than a book or two. New on the left. And it’s even thinner than that once you squish the air out! 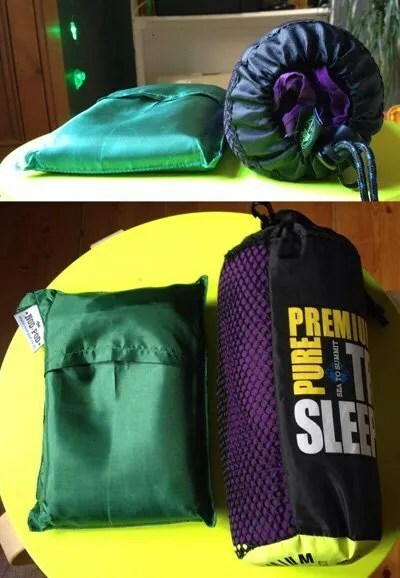 This week I got a new sleeping bag liner/sleep sheet thing, which I’m disproportionately thrilled by. My old one is cotton and ginormous in terms of pack real estate. I’ve been eying silk ones for ages because they’re tiny, and very nearly went for a silksak, but at the last minute, due to wandering eyes on Amazon, went for the Nod-Pod , an artificial silk (made in the UK by a small business!) option. It’s soooo much smaller than the cotton one! This thing is at least a quarter the size if not smaller. And very well-reviewed too, so I hope it was the right choice. It was only £20, which is probably not a whole lot more than I paid for the cotton one 12 or so years ago. I’ve also recently bought a new travel towel, which is slightly bigger than my old one. BUT, it’s also much bigger in area, so unlike the old one, I’d feel plenty comfortable walking down a hostel hallway wrapped in this one. When I bought the original, for some reason I couldn’t find a towel big enough to modestly cover a 5’11” lady and have been looking out for one ever since. And I’m happy to give a bit of extra space for a good towel, because as we all know, it’s the most important thing when traveling the universe. I have even considered bringing both my old AND my new one. There are times when dry towels are worth their weight in gold. But I think I’ve decided against that, mostly because I can use a sarong or a scarf as a backup, and multipurpose items are key. Alas, the one thing I can’t really downsize is my shoes, because my feet are huge, you guys, and shoes take up SPACE. Now that I’ll be doing some dancing, I have to take the requisite shoes for that, which do squish down a fair amount, but it’s still one more pair of shoes than I originally intended. Hopefully all my other packing efficiencies will mean this doesn’t matter much though. (After all, I’m turning into a packing cube BOSS). When does solo equal stupid?